There’s a wide world of fermentation that has nothing to do with alcohol! 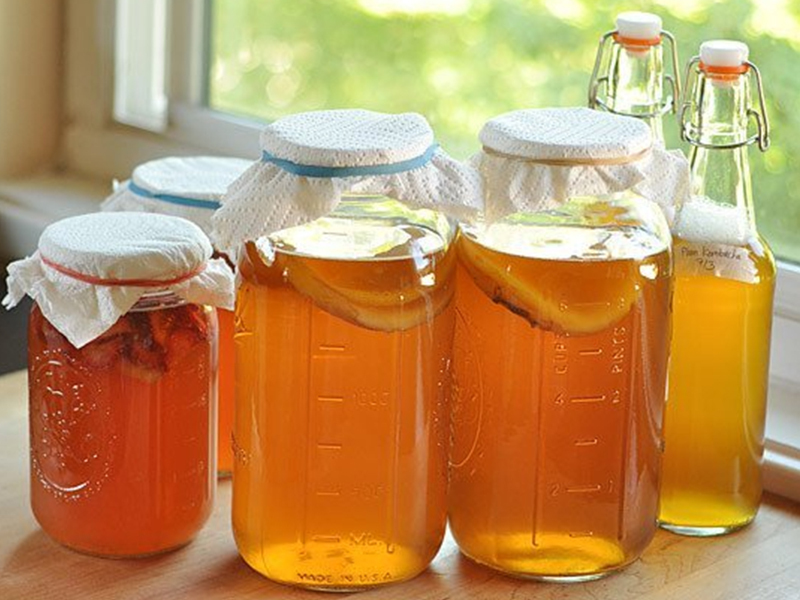 This natural process transforms the taste and consistency of foods—turning water into creamy kefir and tea into bubbly kombucha. The microbes involved in the fermentation process have gut-friendly probiotic effects. Plus fermentation creates other beneficial by-products, such as vitamin B. Some people assert that fermented drinks also help to improve immunity. To reap the benefits of this latest health trend why not try incorporating these recipes into your routine. Not only will you learn how to ferment but you’ll treat your taste buds to a whole new, delicious experience! Kefir is a fermented milk drink rich in calcium. Kefir is a cultured, enzyme-rich food filled with friendly micro-organisms that help balance your “inner ecosystem.” More nutritious and therapeutic than yogurt, it supplies complete protein, essential minerals, and valuable B vitamins. A recent study indicates that drinking Kefir may improve lactose digestion in lactose-intolerant people. That’s in part because the bacteria that ferment milk help break down milk’s lactose into more digestible lactic acid and lactate. Fresh or frozen organic fruits, strawberries, raspberries, bananas, kiwi, mango etc. Blend together for a delicious, nutritious breakfast, lunch, or snack and enjoy! Water kefir is a probiotic beverage made with water kefir grains. Water kefir grains can be used to culture sugar water, juice, or coconut water. Water kefir grains consist of bacteria and yeast existing in a symbiotic relationship. The term kefir grains describes the look of the culture only. Water kefir grains contain no actual “grains” such as wheat, rye, etc. Water kefir contains fewer strains of bacteria and yeasts than milk kefir, but far more than other cultured products like yogurt or buttermilk.”grains” such as wheat, rye, etc. Watch this video for simple instructions on making your own kefir water!